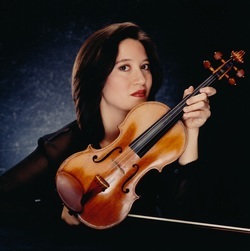 Miyo Curnow joined The Philadelphia Orchestra violin section in March of 2002. Prior to her appointment, she was a member of the Dallas Symphony from 1995 – 2002, initially as a second violin and then, upon winning an audition, she became a member of the first violin section. Born in New York City, Ms. Curnow began her musical studies at age three, and by age nine she was accepted into the pre-college division of the Juilliard School where she studied with Louise Behrend and Christine Dethier. After 10 years in the pre-college and college divisions at Juilliard, Ms. Curnow transferred to Indiana University where she studied with Henryk Kowalski and received a Bachelor of Music degree. Upon graduating from Indiana she pursued a Master of Music degree from the San Francisco Conservatory, studying with Stuart Canin, and freelanced with ensembles such as the San Francisco Symphony and the San Francisco Opera and Ballet orchestras.